PRAYER PROMPT ••• I always wonder what houses look like on the inside. Though we’ve been in our house for several years now, I still keep up with new listings on Zillow.com. And it’s not unheard of for me to drive by a house for sale, then look up the address so I can see if there are pictures of the inside. I just like looking at houses. My curiosity boils down to my sentimental nature… a house is where memories grow and each one is so personally unique, with style and decor reflective of the people who live there. Even in a tract house, built like dozens of others, it’s the inside that is different. And so is the same for people. We all have different exteriors, but we’re all uniquely decorated on the inside. 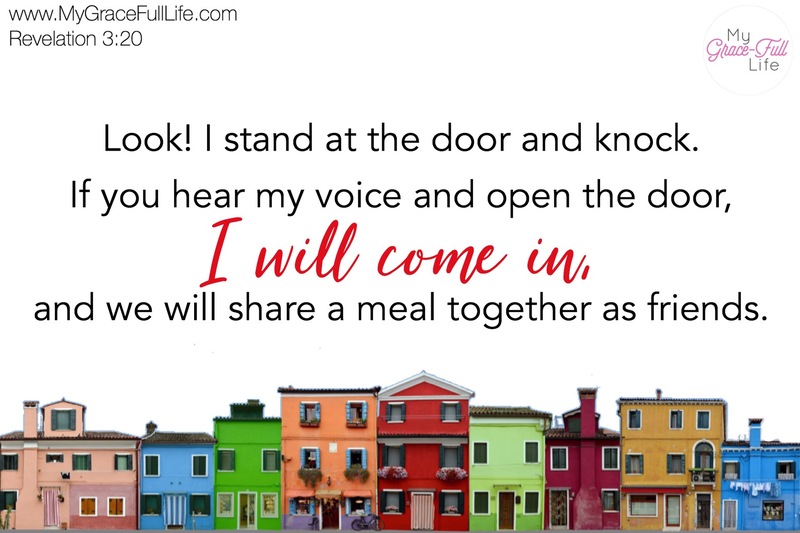 And no matter what our “house” looks like, for every person who has ever been conceived, there’s Jesus, knocking on the door of their heart, asking to come in. For some, they hear the knocking and ignore it. Jesus is a gentleman and He’s not going to barge down the door and force Himself on anyone who doesn’t want Him there. Then others feel like they need to get the house in order first, not realizing that Jesus is willing to do the clean up Himself! The third group are those of us who have opened the door to Him. Is there anything better? Y’all, what can we do to help others realize they need to open the door? We all know someone who is living in a house where Jesus hasn’t been welcomed. I don’t know about you, but I don’t want to stand in front of Him one day and have to tell Him that I failed to encourage my neighbors to open their own doors. Today, as you pray, pray for those who need to open the doors of their hearts to Jesus. Ask for the courage to kindly encourage them to receive Him. Pray that you will model the hospitality that comes from letting Jesus in your heart.